When I was a little girl, the trilogy about Sissi, the unfortunate Austrian empress, was shown pretty much every Christmas season. I would always watch it. I remember my fascination with the beautiful Romy Schneider, and the glitz and glamour of the imperial court. Everything looked like a fairytale. I may not have felt like that if I had been allowed to watch them all in their entirety. But come 9:00 pm, my mom, ignoring my begging to stay up just a little bit more, would send me swiftly to bed. When I became old enough to stay up till late, the movies were rarely shown. 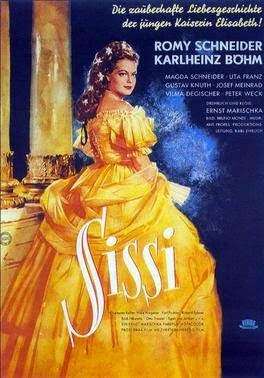 Sissi, the first movie in the trilogy, focuses on the fateful meeting of the Emperor Franz Joseph and his beautiful bride, Elizabeth of Bavaria. Elizabeth had travelled with her family to Bad Ischl, where her sister was supposed to be betrothed to Franz Ferdinand. But when the young Emperor met Sissi, he fell deeply in love with her, and declared he would marry no one else. Elizabeth, a free spirit and still immature young girl, was reluctant to become empress and take up the many responsibilities that came with that role. Yet, within the year, the couple was married. The film is a highly romanticized account of their early relationship, with Sissi loving Franz as passionately as he loved her. Yet, you can still see the clouds looming in the background, as the young princess is torn between her love for her betrothed and her fear at being imprisoned in a gilded case at the Austrian court. 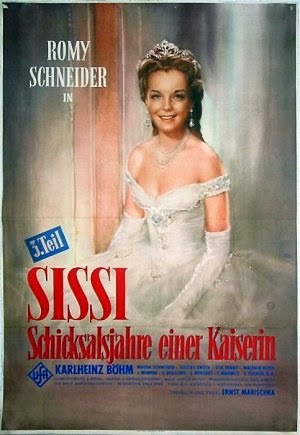 Sissi, played by the lovely and talented Romy Schneider, is lively, spontaneous, and a tad mischievous. No wonder Franz, played by Karlheinz Böhm, whose life is strictly regulated by court etiquette and imperial duties, falls for her. His mother, the Archduchess Sophie, believes Sissi unsuitable for her role, clearly stating her disapproval for the match, and, when it is evident that Franz will have his way, trying to turn her future daughter-in-law into a “proper” empress. She often comes across as cold and heartless, but that’s only because she anticipates the struggles her son and his bride will have to face in the future. Doesn’t matter how much they love each other, the demands of their empire will always come between them. Sissi’s family, instead, is, just like her, lively and spontaneous. The parents love each other and their brood of children very much and show their love at any opportunity. The settings are beautiful. The mountain in Bavaria and Austria are breathtaking, and so is the imperial court with all its luxury and pageantry. Just like the costumes, the settings are as accurate as possible. I think this is the movie of the trilogy that I enjoyed the most as it perfectly captures the feelings of hope and joy that characterized the beginning of what turned out to be quite a tragic union. Elizabeth, now married, is doing her best to be a good empress. She’s learning foreign languages, especially Hungarian, which she, like the country, adores, and has a captivating, open, manner capable of charming all her subjects, even the most rebellious. She is a great asset to her imperial family, but she could have made even a bigger contribution if she had been better supported by her family. Instead, Franz often leaves his wife alone, and his mother decides, with his approval to take her young granddaughter away from her mother and raise her herself. That was a cruel blow to Sissi, and the real beginning of her problems with her husband, as well as the breakdown of both her physical and mental health. Although not mentioned in the movie, Sissi would become so obsessed with her looks to starve herself and undergo rigorous exercise regimes to maintain her thin waist and looks, probably feeling like her body was the only thing in her life that she could control. Instead, what the movie shows is Sissi who, unable to endure life at court, starts spending more and more time away from it. Costumes and settings too are once again beautiful and accurate. As in the first movie, all the actors do an excellent job. Schneider, though, shines above them all, poignantly portraying the charm and sorrows, privileges and tragedies of one of the most beautiful and famous women in the world. In the last movie of the trilogy, Sissi continues to capture the hearts of all she meets. But her marriage is still struggling and her health deteriorating. Although the movie doesn’t show the catalyst for her illness, which was the death of her first child, Sophie. Instead, throughout the movie, Sissi and Franz only have one child, Gisela. 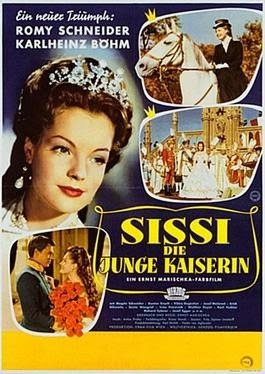 I understand the difficulties in telling Sissi’s story in just three movies. Including everything is certainly not possible. But focusing a bit more on the tragedies the couple faced would allow the viewer to better understand the empress’ illness and desperation. Sissi gets so ill that doctors start despairing for her life. In the end, her mother Ludovika comes to her rescue. After her health is restored, Elizabeth starts travelling around Europe. But she still goes back to Franz, to be at his side when duty commands. One of this duties is the tour of the Italian regions annexed, against their will, to the empire. The imperial couple receives a cold, hostile reception, but once again Sissi, with her natural and unaffected charm, is able to win their love as well. Fateful Years Of An Empress has the same pros as the other movies in the trilogy. Wonderful actors, stunning settings, and accurate costumes. Yet, it is the one that departs the most from history, which is why it is my least favourite. Even so, it’s a shame that Schneider felt so trapped in her role as Sissi that she refused to take part in more movies about the Austrian empress. They would have been wonderful too, I’m sure. Overall, though, it was a nice ending to a trilogy that captured quite well the first years of the marriage of the ill-fated lovers Sissi and Franz Joseph. Have you ever seen the trilogy? If so, what do you think of it?